Editor's Message: Who’s Leading the Pipeline Industry? 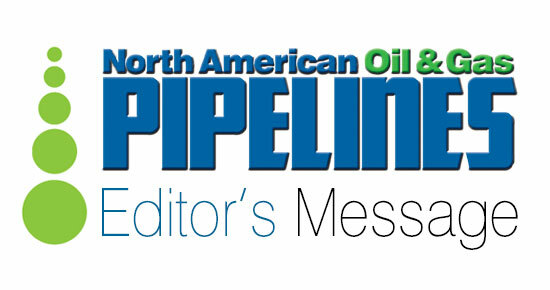 Editor’s Message: Who’s Leading the Pipeline Industry? We’re looking for a few good pipeliners. Each new pipeline project brings along a different set of challenges. Whether it’s navigating a difficult installation or fostering public support, strong leadership always shines through the difficulties. Leadership is embodied by the people who rally support for a project, by projects that highlight innovative practices or companies that embrace new processes to improve efficiency, safety and integrity. Each year we shine a spotlight on those leaders with the Pipeline Leadership Award. The award was created to recognize industry leadership and the implementation of innovative techniques and methods, proven on actual projects or process management to improve quality and integrity in the oil and gas pipeline industry, as well as to reduce the cost of construction, operation and maintenance. Nominations for the 2018 Pipeline Leadership Award are due Aug. 3. I encourage you to enter distinguished individuals, companies, projects or initiatives to be recognized for excellence in leadership in the oil and gas pipeline sector. Winners will be featured on the cover of the November/December 2018 issue of this magazine and officially honored at the Pipeline Leadership Conference, Nov. 7-8, in The Woodlands, Texas. The annual award honors important advances in the construction, operation and maintenance of oil and gas pipelines, including innovations in the construction process, design, procurement, contract administration, management, labor relations, training and safety that improve the global pipeline industry. The Pipeline Leadership Award also recognizes projects for their innovative concepts and methods. Award winners are selected from a pool of nominations obtained through the Pipeline Leadership Conference website. Nominations are open to anyone wishing to participate. Pipeline industry members are encouraged to nominate successful innovations by their colleagues, clients, consultants, contractors, suppliers and trades persons. Self-nominations are also encouraged, since many subjects are best understood and presented by their creator. Past winners include Chuck Shafer of NiSource in 2015, Pat Michels of Michels Corp. in 2016 and Pat Tielborg of the Pipe Line Contractors Association (PLCA) in 2017. Each of these individuals showcased their leadership skills to overcome the intrinsic obstacles that the oil and gas pipeline industry faces, day in and day out. So, who’s leading the pipeline industry? Let me know! You can do so by visiting plconference.com and clicking on “Pipeline Leadership Award” in the navigation bar to find the entry form. Or, you can email me directly at bkramer@benjaminmedia.com. Let’s share the successes of the pipeline industry and shine a light forward for future generations.